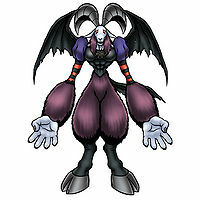 A Fallen Angel Digimon which has the appearance of a giant ram. 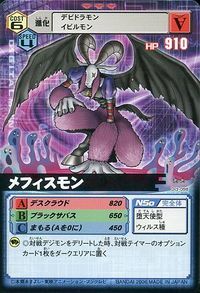 It is also a dark being born from the lingering thought-data of an Apocalymon that attempted to destroy all life. 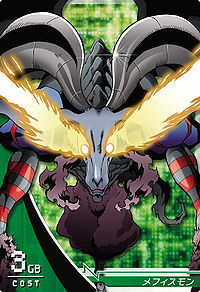 Like Apocalymon, its governing principle is the extermination of all life. It specializes in the black magic of the Dark-species, and its personality is endlessly cruel. However, it is highly intelligent, and is also a tactician. Its Signature Move "Black Sabbath" is a dark incantation in which it prays for a festival of death. Those who hear this spell will soon die. Its Special Move is generating a cloud of darkness which causes everything to decay (Death Cloud). 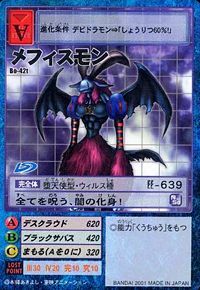 Comes from From Mephistopheles (Μεφιστοφελής) 「メフィストフェレス Mefisutoferesu」, a name for the devil in the legend Dr. Faustus. Greek for "One that is not a lover of light." 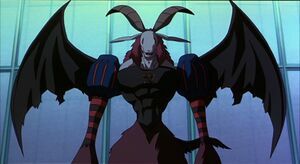 Mephismon's design is based on the Baphomet, the pagan idol of the Templars and the deity of the sorcerers' Sabbat, although many elements of Mephismon are derived from the illustration "Baphomet, the Goat of Mendes", also referred to as the "Sabbatic Goat", drawn by Eliphas Lévi and included in Dogme et Rituel de la Haute Magie. The pentagram on its chest is a reference to this and its appearance is based on a variant of the Elder Sign, a magical symbol created by the Elder Gods as a form of protection against the Great Old Ones in Cthulhu Mythos, first described by August Derleth in The Lurker at the Threshold. 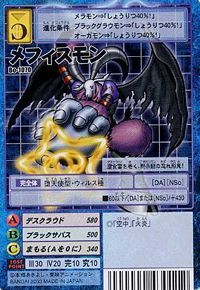 To complement this, its attacks are based on themes which involve forms of black magic and Satanism, which in particular applies to its Special Move "Black Sabbath", whose name itself is a reference to the Black Mass, a satanic ritual celebrated during the Witches' Sabbath. 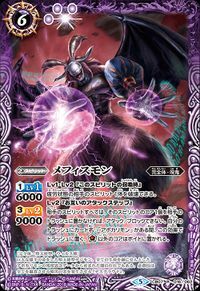 Death Cloud  デスクラウド Desu Kuraudo Generates a cloud of darkness that corrodes everything. Black Sabbath  ブラックサバス Burakku Sabasu Uses a dark incantation to pray for a festival of death, or fires a dark shock wave from its hand. Mephismon was formed from the remains of an Apocalymon. He was chased by an Omegamon and fled to the Tamers universe. There he assumed the appearance of the president of V Pets Laboratories and used the V Pets the company produced to spread viruses. 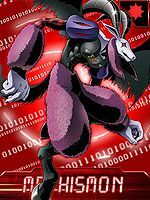 The Tamers faced him and at first he had the upper hand but Minami says the keyword to activate the anti-virus program in Labramon. With his viruses defeated Mephismon evolves into Gulfmon to continue the battle. Mephismon is available as a Digimon Medal. Mephismon is an unobtainable Leader Digimon. 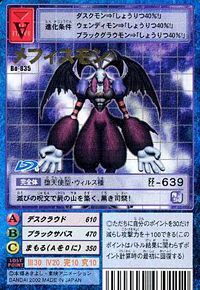 Elements of Apocalymon's darkness have transcended dimensions to accomplish an evil evolution! 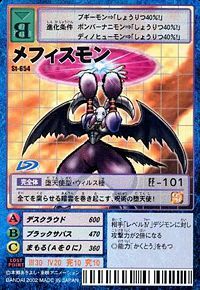 It generates dark clouds that corrode everything, the fallen angel of incantations! This black priest piles up mountains of incantations of damnation! It wraps a Death Cloud, a memento of Apocalymon! It curses everything, the embodiment of darkness! Born from the remnant thoughts of Apocalymon, it yearns for revenge against Omegamon as well as the annihilation of all life. It is highly intelligent and exercises great caution when refining its tactics. 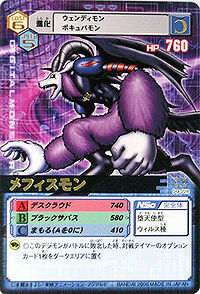 A Fallen Angel Digimon which has the appearance of a giant ram. 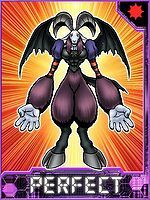 It is also a dark being born from the lingering thought-data of an Apocalymon that attempted to destroy all life. Its Special Move is generating a cloud of darkness which causes everything to decay (Death Cloud). This page was last modified on 6 January 2019, at 09:28.